I usually have my hair at my chin, but in 2003 I started growing my hair out for a mission trip. My thinking was, if it's long enough I can just throw it back in a ponytail and just not mess with it. Once I got back, I was talking with a friend about how I was considering cutting my hair. She recommended that I wait and let it grow out some more because it was almost long enough to give to "Locks of Love." A friend of hers had just gone through chemotherapy and lost all her hair so it was fresh on her mind. I thought it was such a great idea so I agreed. I just kept letting it grow. Then I heard about Shear Hope from Jade on 89.7 Power FM. All I could think was "That is amazing!" I've never been more sure that I wanted to do something as I have been about this. I love that it is help in three ways. First, much needed financial help is raised for families who go through the trails that come with cancer. 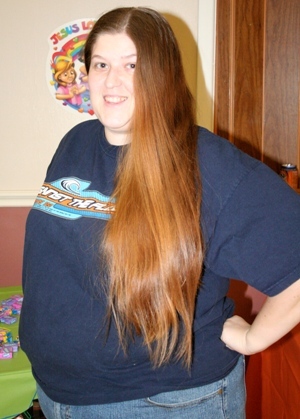 Second, my hair will be used for wigs that will go to those who have lost their hair through a disease such as cancer. Third, I will be a walking encouragement to others that says, "people care about those who are hurting because of that illness." I've never been more excited about anything in my life!